There were no zombies chasing me. There was no grand prize for coming in among the last 1/3 of the herd. I had plenty of other things to do that Sunday. I paid to be here. Now, let's go back 15 months to June, 2011. There are no pictures of me running. Because up to that point, that is, the first 31 years and 9 months of my life, I did not run. Let me rephrase that I ran only when ultimately forced to. You know, like at gun point. The fact is for 31 years, 9 months I had a HATE-HATE MORE relationship with running. It didn't like me and I sure as hell didn't like it. Like the student in class I repeated to myself and everyone that would listen, "I'm just not meant to be run. I'll stick with other things." But that clearly changed. Indeed, last year, I ran a marathon and this year, I'll run several more. Along the many miles I've run over the last few years, I learned to love running a whole lot to the point that I've spent thousands of hours running and thousands of words writing about running. In this evolution from non-runner to enthusiastic (almost obsessive, I'll admit) runner, I realized that there is a lot that I've drawn from running that helps me think about learning because somewhere along the line, I learned to run in a way that worked for me. Here are the 10 ways that running reminds me of the challenges of learning. 1. I started slow and I am still slow and that's ok. I have to run at a pace that works for me. I can't worry about how fast other people are running. Sure, I can sometimes look at it as motivation to speed up a little but the focus must be on me and what my body and mind are telling me. This rings true for learning. We are often disenchanted with our progress because someone else gets a subject matter much better than we do because it's not our forte or we don't have the right background to approach it as skillfully as others. 2. I had to figure out what worked for me. There's lots of different methods to approach running out there. Prior to my experience, people told me all sorts of ways to do it. But I had to figure out what worked and what didn't work for me. This meant a lot of trial and error. In fact, this is where many people will abandon running because they can't seem to find the right way to approach it that works for them personally. In this vein, I think learning is quite similar particularly around certain subject matter. How some people learn a subject matter is going to be dependent on trying and finding different ways to approach the subject. 3. I set a range of goals to indicate levels of success. Run until you make it to this marker. Run as far around the lake as you did yesterday and 100 feet further. As I made progress, I set new goals and made sure to have a range. That might include having a range within a race (my low goal is 30 minutes, my high goal is 25 minutes) or a range over a particular season (run at least 6 half-marathons or longer and 1 full marathon). The goal was to make sure I had different ways to measure success. This was helpful because it connected with #2 in that, I needed to see what goals were more motivating for me. Similarly with learning, if you set to task, "I'm going to learn math." You're setting up a massive goal. So why do that or at least consider it a large goal with a long-term plan composed of smaller goals and objectives. What are the smaller goals that can be stacked to get you to the larger goal? 4. I set time aside to both think about (write) and do it (run). It goes without saying that you need to set time aside to achieve the goal. That was obvious--though not without its challenges. Eventually, I went the route of buying a treadmill so that in the harder weather I didn't have to rely on going to the gym and such. It saved time to have easy and unlimited access to it. Besides setting aside time to do it, I also made sure to think a lot about the running. Visualizing myself running the race at top speed in perfect form has contributed to some great breakthroughs in my performance. For learning, this means you have to set time aside and that time can't be the very last minute. You have to incorporate it in some clear ways into your life's routine and you also need to think about it. You shouldn't be thinking about "I need to do it" but you should be engaging with the content in your head--even when you don't have to. This is where learning can take place through reinforcement. 5. I kept track of my progress because nobody else would. I initially kept track of my runs on my Fitbit monitor but then moved into DailyMile, which has been fun and adds a nice social element to it as well. I also continued to keep track of progress on this blog of course. Keeping track is important because so often, we are looking forward and seeing the end goal still rather far away, but we need to look back and appreciate how far we have made it. It's also important because if I'm trying to get somewhere, I have to know where I am within the big picture, right? With learning, looking back is also important because it can provide you with a means of reflecting and appreciating where you are within the subject matter and how much progress on the subject that you've made. 6. I hit walls; I asked for help. I most definitely hit some walls and places where I needed help. I asked for help. I had no shame in asking for help and encouragement from my friends and social-networks. My friends and family want me to succeed and want to help me if they can. The same holds for learning. When you hit walls (and you will hit walls), reach out for help from friends, family, or people more versed in the subject matter. Largely, people like helping others--especially if it is something they are vested in. 7. I was overwhelmed at times by it all; I wrote about it. There will always be times when I think about running and am overwhelmed by it. Overwhelmed by what I've done, overwhelmed by what I'm trying to do, overwhelmed by the mere idea that I am doing it. Hell, I could even brim with tears at times. That's all good! That's a reflection of investment. If you're so vested in learning something that you're emotionally moved; that's not a bad thing. It shows how important it is to you. For me, writing about it helped a lot because it allowed me to sort things out and to stay on focus. Writing may not work for you (especially, if you're trying to learn writing), but find an outlet to channel the emotions and ideas about the subject matter. 8. I talked about my running (sometimes, quite excessively). If running was important to me, then I should be talking about it just like other things that are important to me. This served two purposes. It had me talking about running--which is something runners do. Talking about running reinforced the fact that I ran and was continuing to run. I had never thought of myself as a "runner" but sure enough, I found that I was. By sharing with other people in my life, it became a point of conversation. We would talk about running or friends would ask me about my most recent race. The most amazing moment of talking about running came when people started asking me for advice or told me that my actions were inspiring them to run. When it comes to learning, the more you talk about and engage in the topic, the more likely you are to think about the subject matter and even gain mastery over it. 9. I owned my accomplishments and gave room for others to acknowledge them too. I took pride in what I was able to do. I won no races, but I had victories at all of my races. 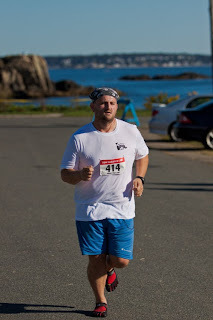 Every time I had a personal best or was just damn happy I showed up, I made note of it. I blogged about it, I posted in FB and Twitter about it. I celebrated my progress. In sharing my victories, many others also provided congratulations which added to the positive feelings I had about running. I also made sure to give thanks to those who helped. You need to celebrate the victories that you make--regardless of where others are in their learning. 10. I valued the experience for the internal value; not just the external benefits (though they were nice). I came to recognize that running provided me with many internal benefits that were useful. The mental health benefits of running are many to count. The better health reports I get from my doctor are also important. The respect and admiration I get from friends, family, and colleagues--that's nice too. I run for me--but that respect and admiration has proven a powerful tool to get me to that point. For learning, this is the big challenge: the crossover. That is, the moment when learning the subject is internally valued (you want to learn because it helps you understand your life more) more than extrinsically valued (you want to learn because you want an A on the examine). Those are my top 10 ways that running reminds me of learning. What about you? How else does running remind you of learning?